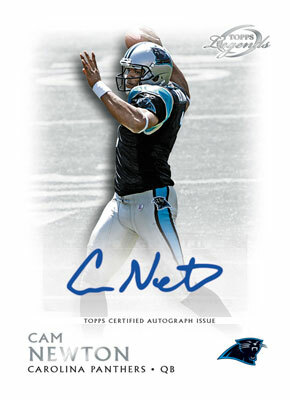 2011 Topps Gridiron Legends Football tips its hat to multiple generations of NFL football, presenting a slate of past, present and future stars. Current superstars, up-and-coming rookies and timeless legends collide in this beautiful-looking mid-range set that combines old and new. Each box guarantees four hits, at least one of which will be an autograph. Additional highlights include reprint autographs from players who appeared in Topps' first football set in 1956, stamp-relic autographs, and dual and triple signature cards. Product Configuration: 18 packs per box, eight cards per pack. 165-card base set: 80 veterans, 55 rookie cards, 30 retired stars. Base set parallels (1:1): Blue, Bronze (/299), Green (/150), Gold (/99), Red (/75), Orange (/50), Purple (/10), Black (/1). Autograph Rookie Card Variations are available for all 55 first-year players in the set. Parallels: Bronze (/99), Red (/50), Gold (/10), Black (/1). 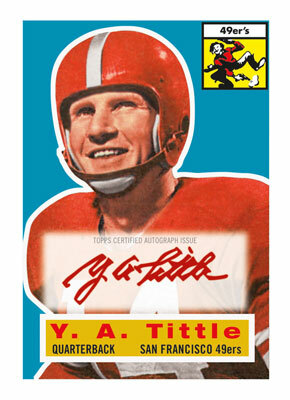 1956 Topps Reprint Autographed Cards feature on-card signatures from a handful of players who appeared in Topps' debut pigskin set 55 years ago. Red ink parallels (/10) are exclusive to hobby packs. Legends Autographs (25 cards) feature signatures from several of the game's greats including Gale Sayers, Steve Young and Kurt Warner. Fifteen of these players appear on relic parallels (/25) and patch parallels (/1). Canton Hopefuls Autographs (20 cards) include some of the best of today's NFL stars like Peyton Manning, Adrian Peterson and Ray Lewis. Relic (/25) and patch (/1) parallels also appear for ten players. Future Legends Autographs (36 cards) give collectors yet another chance at signatures from the 2011 rookie class. Twenty-five players have parallels with relic (/25) and patch (/1) swatches. Dual Autographs (10 cards, /25)) and Triple Autographs (five cards, /15) mix current stars, rookies and legends. Each of these are mirrored with relic (Dual: /10, Triple: /5) and patch (/1) parallels. Stamp of Approval Autographs (30 cards, /10) combine signatures with stamps from the featured player's home state. The checklist includes players from both yesteryear and today. Also available in relic versions. 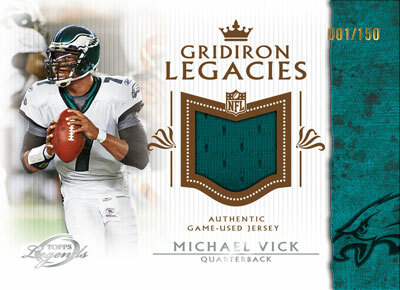 Gridiron Legacies Relics (20 cards, /150) feature jersey swatches on a clean design. Parallels (for ten of the cards): Super Swatch (/15) and Multi-Jumbo Patch (/5). Aspiring Legacies Relics (36 cards) highlight 36 rookies with jersey swatches measuring one inch by one inch. Parallels: Green (/150), Red (/99), Gold (/50). 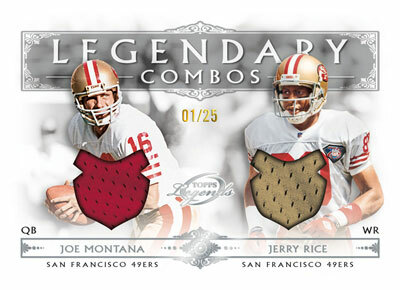 Legendary Combo Relics (25 cards, /25) pair up players with dual jersey swatches. Gridiron Legacies (25 cards) spotlight legends and current stars. Aspiring Legacies (36 cards) is an insert set that includes the most promising rookies of the season. Legendary Combos (25 cards) highlight some of the game's best-ever pairings.